Key Difference: The Samsung Galaxy Tab 3 7.0 sports a 7-inch WSVGA TFT touchscreen and has the dimensions 188 x 111.1 x 9.9 mm, making the device thinner compared to the former tablet. The tablet is actually targeted for the low-end range. The Nexus 10 is a tablet computer running Android 4.2 (also named Jelly Bean) operating system, which was released with it. It was developed in collaboration with Samsung. Samsung announced the addition of a brand new 7-inch device to its tablet line-up. The device, dubbed Samsung Galaxy Tab 3 7.0 is the successor to the Galaxy Tab 2. 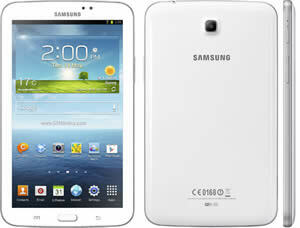 If users were waiting on another high-end tablet from the makers of Galaxy S4, well it will be a huge disappointment. The tablet is actually targeted for the low-end range. The device does come with some upgrades compared to the Tab 2; but in terms of hardware, the device still lags behind the other mid-to-high range tablets. The Samsung Galaxy Tab 3 7.0 sports a 7-inch WSVGA TFT touchscreen and has the dimensions 188 x 111.1 x 9.9 mm, making the device thinner compared to the former tablet. The screen has approximately 169 ppi density, giving it a decent resolution, but not the best available in the market. The company has styled the tablet after the S4 and the Galaxy Note, making it sleeker and more comfortable to hold. The device will be available in two models: Wi-Fi only and one with SIM support. The SIM model only support 2G and 3G functions. The Wi-Fi model will be available in the market as early as May 2013, while the GSM model will hit the markets in June. The company has announced that the tablet will have a dual-core processor that will clock around 1.2 GHz and 1 GB RAM, which makes the device better in terms of speed compared to the Tab 2. The device will come with the company’s TouchWiz UX UI that was launched on the Galaxy S3 and will sport Android 4.1 Jelly Bean out of the box. The device offers ample amount of storage with 8/16 GB internal storage capacity, which can be boosted by 64 GB using a microSD card. One feature that might help increase sales of the device is the USB-capability, which is lacking feature in many tablets. Galaxy Tab 3 will house a 3.15 MP autofocus rear camera and a 1.3 MP front camera for video calls. The cameras are not state-of-the art but they are decent enough for taking photos and video conferencing. The device does offer features such as geo-tagging and an LED flash. The device is powered by a non-removable Li-Ion 4000 mAh battery. Samsung has also integrated the phone with Google services, including Google Now. The device may not be for the users that are allowing for full-functional high-end tablet, but this is the perfect tablet for families that require a low-end tablet for internet browsing and gaming. Among the number of various companies launching phones based on Google’s Android, Google has also launched its own line of smartphones based on Android, called the Google Nexus. Each device in the Nexus line is produced via collaboration between Google and a leading original equipment manufacturer (OEM) partner. The Nexus devices in general have an advantage over other devices in that the Android in the Nexus devices is pure, i.e. the Android does not have any manufacturer or wireless carrier modifications to it, such as a custom graphical user interface. The Android also has an unlockable bootloader to allow further development and end-user modification, all of which is usually blocked on other Android smartphones. The Nexus 10 features Photo Sphere, a new camera technology that allows one to take 360 deg Panorama shots. The tablet also features a quick settings menu, allows for application of widgets on the lock screen, as well as gesture typing; an updated version of Google Now; and multiple user accounts for tablets. The tablet offers a new share and customize feature that allows multiple users to create their own profile and customize it according to their own needs. The tablet offers a 5 MP rear camera and a 1.9 MP front camera for video chatting. The tablet does not support SIM capability. The device also allows nine people to chat simultaneously using Google Hangouts. 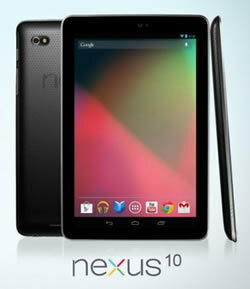 The Nexus 10 is available for approximately USD 399, with the price varying depending on the model. The information for the detailed table about the two devices has been taken from Samsung Mobile Press website and GSMArena.com. Google; designed in collaboration with and manufactured by Samsung. GPRS, EDGE, WLAN, Bluetooth, Infrared port, USB.